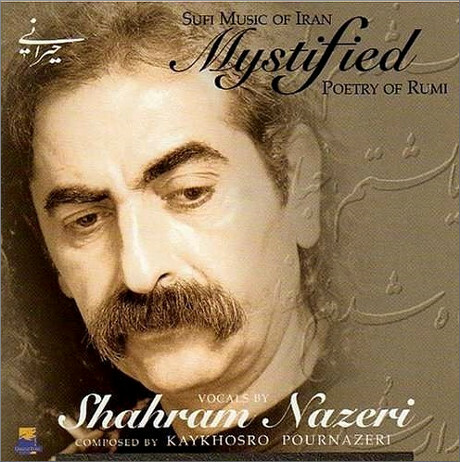 ...the swirling melisma of the Iranian singer, whose power and timbre could make many of our tenors blush with shame... What strength in this piece of Nazeri's. What magical, mystical simplicity, this architecture of percussion that supports the slow pulsation of the song, the distant rhythms of the ectasy to be attained, a hypnotic zikr that sticks in your ears and stays with you for hours on end. All of which makes it puzzling that Compass is off the radar of the classical taste makers. Or perhaps not so puzzling when it is realised that the novel ventures beyond the ubiquitous Mahlerian existential angst which defines the stereotype of fin de siècle Vienna, to explore the fault line where Friedrich Rückert and others rubbed up against Orientalism. That creative friction produced, inter alia Goethe's West–östlicher Divan, a collection of lyrical verse inspired by the Persian Sufi poet Hafez. Despite this, the lineage of Daniel Barenboim's West–Eastern Divan Orchestra remains obfuscated: in fact the first result returned by a Google search for 'West–Eastern Divan Orchestra Sufism' is my 2014 Salzburg Summer Festival essay Listening with the ear of the heart. At a time when precisely defined congeniality prevails, West-East harmony spins well but mystical Islam does not. Any copyrighted material is included as "fair use" for critical analysis only, and will be removed at the request of copyright owner(s). On An Overgrown Path is no longer linked on social media. But new posts can be received by RSS/email by simply entering your email address in the right-hand sidebar. Is £80 for the top price tickets for Barenboim and the West-East Divan Orchestra at Snape on August 13th a record for Aldeburgh? 'Compass' is a superb novel. Though ultimately about a failed encounter, and with a narrator who fails all along the way, it covers a vast range of 'obscure'/obscured musics. I read it on holiday and came home with a notebook full of leads to follow up. Perhaps a remedy lies in the opening image of Ken Russell's fantastic film "Mahler": from the pastoral quiet of Wörthersee, his cabin is suddenly and violently enveloped in flames synchronized to the sudden and violent G sharp minor chord from the first movement of the 10th Symphony. As the unnamed American soldier in Vietnam famously said, perhaps we'll have to burn it down to save it. Quite so John. And perhaps the same remedy can be applied to social media.